Ben & Jerry's will completely switch from single-use plastic straws and spoons to wooden spoons and paper straws in their over 600 Scoop Shops worldwide by April 9, 2019 (just in time for their annual Free Cone Day celebration). The change will remove about 2.5 million plastic straws and 30 million plastic spoons from being thrown away each year. The switch has been a work in progress since at least last year. Additionally, Ben & Jerry's plans to find an alternative to clear plastic cups, plastic-lined cups, and plastic lids by the end of 2020. 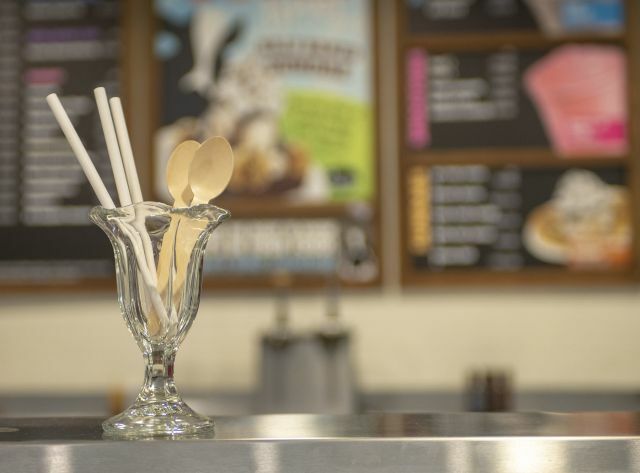 As far as their retail footprint goes, they are searching for a biodegradable and compostable coating to replace the current polyethylene layer that serves as a moisture barrier between the ice cream and the paperboard container.